I was called to substitute on the Friday night rowing team. It was a very casual pace around the inner harbor of New Bedford, MA. 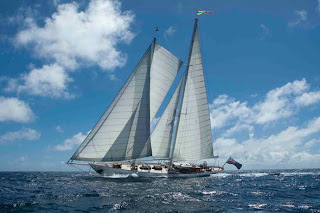 We approached a huge yacht from the RTYC which may be the Royal Thames Yacht Club. It was flying either the New Zealand of Australian flag. I didn't make not of the color of the stars which is the distinguishing feature of each of them. Her name is Gloria and she is classified as a superyacht. Author and fishing boat Captain Linda Greenlaw, was in the area for book signings. 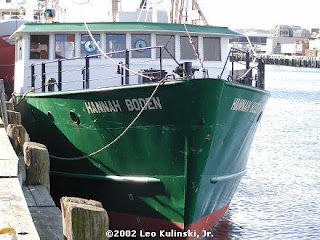 She is most famous as the woman captain from the story and movie "A Perfect Storm" She recently signed on to captain the Hanna Bowden, the sister ship of the Andrea Gale, to swordfish out of our port of New Bedford. While working the music festival last weekend I was introduced to Gus, better known as Reverend Bread. He does a breakfast for the homeless every Saturday morning and invited me to come down and help out. I readily accepted and showed up at 7AM to prep things. The unique part of this breakfast is that it's run like a restaurant. The people come in and sit around waiting for the meal to begin. Because they are not in a line waiting but sitting or mingling in the hall, dialogs begin and soon they begin to get to know each other. At 8AM we have them grab a seat and we begin to serve breakfast. Every thing is brought to them, we serve as if we were waiters. Always from the right of the patron. Today was juice and coffee as a start. French toast with sausage and home fries was served and there was enough for seconds for anyone who so desired. This will no doubt be a regular Saturday routine for me. BTW the help is in by 7 and out by 9:15, so it's not that much of a commitment, but so worthwhile. 1980's was the year when [B][URL=http://www.salethomassabo.com]Thomas Sabo Onlineshop[/URL][/B] introduced his jewelry. Effort has been put in to create pure ornaments in silver with exceptional excellent, which outcomes [B]Thomas Sabo onlineshop[/B] in formatting it is outstanding model. The two most classical sequence by Thomas Sabo; [B][URL=http://www.salethomassabo.com]Thomas Sabo Onlineshop[/URL][/B] Club and silver Series were created and bring in fresh pieces of designs. Its mentioned about [B][URL=http://www.salethomassabo.com/thomas-sabo-charms.html]Thomas Sabo Charms[/URL][/B] that they represent our craze and obsession. In the event you wish to create a person really feel good and look different amongst the [B]Thomas Sabo schmuck[/B] crowd, this can be a perfect way to do so. In the [B][URL=http://www.salethomassabo.com/thomas-sabo-charms.html]Thomas Sabo Charms[/URL][/B] selection you will discover charms representing the birthstone for every single month. [B]Thomas Sabo[/B] are and can certainly sparkle everywhere you go. [B][URL=http://www.salethomassabo.com]Thomas Sabo Onlineshop[/URL][/B] indications could also be added to this. Their charms are produced in a [B]Thomas Sabo[/B] style and every a person is created to present the distinctive identity of every sign. The kid's club is another special series of charms. This [B]Thomas Sabo schmuck[/B] is meant for youthful young children and teenager. Little ones possess the option to generate their [B][URL=http://www.salethomassabo.com]Thomas Sabo Onlineshop[/URL][/B] individual style also. Exclusive necklaces and bracelets are actually designed to fit smaller children.